Darcy’s return to Cedar Cove Family Camp is marked by a mysterious disappearance, and in Alitheia a new message from the Oracle adds to the riddles that must be deciphered if they are to expel the dark evil that hovers over the land. The six friends and the alchemist Rubidius plan a sea journey that will take them beyond the borders of Alitheia, and into the realm of a legendary archipelago. Tellius winds up joining them as well and the foes they meet along the way are both deceptive and charming, while the Oracle’s riddles seem to dog them at every turn. Please note: The White Thread is the third in the series so this review may contain spoilers for earlier books. You’re welcome to check out my reviews for The Six and The Oracle first, if you’re interested! These two books are on sale for Kindle during August – just $1.99 each! The Six teenagers are now fifteen and head back to Cedar Cove for summer camp. This year things are slightly more tense in Alitheia as the population start becoming displeased with the lack of progress against the dark forces of Tselloch. The group doesn’t get to do anything about it though, as they are all swept off on a rescue mission to liberate the Nark, Yahto Veli, from the Oracle. A sea journey, mysterious islands and evil gods are just some of the obstacles to content with, not to mention new riddles from the Oracle itself. I am a little conflicted with this book. You know how sometimes, in big fantasy series, you read a whole book and feel that nothing much has happened with the main storyline? I felt a little that way with The White Thread. I’ve loved the three books in this series so far and I’ve loved the character and relationship developments in each story, but I was a little disappointed that there was no actual visible progress against Tselloch’s forces during this year. That’s not to say this isn’t a great instalment in the tale! The adventures are still exciting and very well told, and I enjoyed the budding romances within the group of teenagers. I really love the interactions between characters – they seem very realistic to me which makes the story very enjoyable to read. K.B. Hoyle has continued to write what she started with The Six and The Oracle – an action-packed story with plenty of fantasy elements both familiar and imaginatively new. The White Thread is the Darcy Show – she solves all the riddles herself and saves the group’s lives on more than one occasion, occasionally with a bit of help from Tellius. I suppose this is part of her growing sense of responsibility and of settling into her role in Alitheria but I hope that in coming stories we get to see the rest of the Six taking a greater part. The ending felt a little rushed and then left on a cliff-hanger – I really hope the next book isn’t far away because I’m anxious to find out what has happened now! Overall, The White Thread is a solid and enjoyable addition to the Gateway Chronicles, even if the main storyline was not visibly progressed. Fans of teen Fantasy, get a hold of this series! You won’t regret it! Warnings: Some grisly scenes but otherwise squeaky clean. 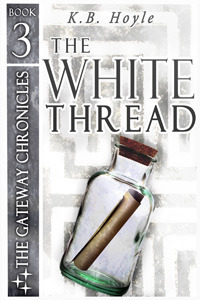 The Writer’s Coffee Shop is offering an e-book copy of The White Thread to give away. You can enter via the Rafflecopter form below. Don’t forget, books one and two of the Gateway Chronicles series, The Six and The Oracle, are on sale for Kindle during August! The giveaway will run until August 22. The winner will be contacted by email and have 48 hours to respond.